WATERBURY, Conn., Nov. 15, 1927 — (By The Associated Press) – Asserting that the church already has been held up to enough public ridicule through the “absurd challenge” of George Invalis of New Britain, George Pistolas, president of the Hellenic Orthodox congregation here, announced Monday night that the Rev. John Gerotheou would ignore all challenges directed at his claimed powers of causing bread to rise without yeast through the use of holy water. Mr. Gerotheou’s powers were disputed also by the American Association for the Advancement of Atheism. Invalis, a soda clerk, announced that he would post $200 in a Waterbury bank today to back up his challenge, but the posting of the money will go unheeded as the challenge has, according to Pistolas. The church official said the congregation would continue to worship as it saw fit regardless of challenges launched at it. On days when the ritual of the Orthodox Greek church permits it, however Mr. Gerotheou would continue to raise bread without yeast, Pistolas said, but only as part of the religious ceremonies of the church. Those at OrthodoxHistory.org were unaware however that this was indeed a ceremony performed, especially among the pious laity and in some monasteries, within the Greek Orthodox Church. I made them aware of it and they expressed that they never heard of this tradition before and posted some information I gave them, but since some important information is in Greek I decided to make my own posting and hopefully spread this pious tradition among the faithful who speak English. 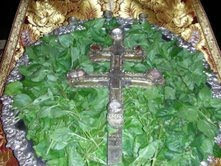 This pious tradition is usually looked upon as a manifestation of the grace within the holy water and blessed basil which is blessed within the Orthodox Church. It can be done any time with blessed basil and holy water either blessed within one's local parish or acquired at some holy shrine that has holy water. Among the Greek faithful, this is done usually twice a year and is associated with feasts of the Holy Cross, which is what sanctifies the holy water with the blessed basil. The two feasts are September 14 for the Feast of the Elevation of the Honorable Cross and the Third Sunday of Great Lent which is dedicated to the Veneration of the Holy Cross. First acquire some basil leaves from the priest. Put some lukewarm water in a pot. In the water only put some flour and mix it until it becomes a thick paste. When this is done take the blessed basil leaves and form a Cross on top of it. You place a clean towel over the pot, and wait a few hours until it's ready. Note: Some boil the basil leaves and with this lukewarm water they prepare the paste. "Behind the icon of the Annunciation which was on display for veneration in the katholikon (central church) of the Monastery are found two shelves. The fathers who serve to bake the prosphora and the breads brought a pot with the paste and placed it on the bottom shelf. On the top shelf they place the basil leaves with the Honorable Cross. They put nothing on top of the paste itself. By the Power of the Honorable Cross it becomes prozimi. Great and wondrous are your ways O Lord!" According to another Greek website who quotes Archimandrite Dositheos, it is important that the basil leaves come directly from the priest and that it should not be taken from an altar boy or grabbed from a tray. He recommends that after the lukewarm water is placed in an unused pot, to take the basil leaves and make a sign of the Cross three times with it in the water. He recommends this be done with basil leaves that have not dried. When blessing the water with the blessed leaves, chant or say the hymns of the Holy Cross such as "Save O Lord Your people" and "You Who were lifted up on the Cross" ("Σώσον Κύριε, τον λαόν Σου" και το "Ο υψωθείς εν τω Σταυρώ"). The basil leaves are taken away and a little flour is put in. 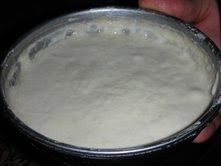 After mixing it to make a thick paste and placing a towel over it, he recommends you put it in a warm area of the home. If you do it before bed, when you wake up add a little more water and flour and let it sit till night. At night do the same. After the third time its ready. He recommends three days for it be ready. Though not difficult, it may take a few trials before you get it right. Over at the Adventures of an Orthodox Mom site, there are instructions on how to do it another way that you may find useful as well. Is this a miracle, as some say? Not necessarily in the traditional sense of what a miracle is according to modern day rationalists. It is not a supernatural event without a natural explanation. It is looked upon as miraculous in the following sense: that it is blessed bread made with ingredients that is blessed by the Church; the manner of the bread rising by a method that is unusual; and the fact that it is done on a holy feast. Though it is all a natural process which can be explained scientifically, still, because of its unusualness and its association with blessed ingredients and ecclesiastical feast days, the pious call it a miracle to preserve its sacred nature transformed through everything that has become associated with it. Rationalists, as in the article above from 1927, will probably find this answer unsatisfying and contradictory to call something natural "miraculous", but this can only be understood by those pious who sanctify on these feast days the natural world and make it sacred through an invisible transformation, much like the waters of baptism were sanctified at the baptism of Jesus on Epiphany. Perhaps this is why Fr. Gerotheou remained silent in the face of opposition; it is not meant to be rationally explained. It is a sacrament, or what the Orthodox call a mystery, of the Church, because through something material, the grace of God comes to those who partake of it with faith.